Authors: Elizabeth A. MacDonald, Eric Donovan, Yukitoshi Nishimura, et al. First Author’s Institution: NASA Goddard Space Flight Center, Greenbelt, MD 20771, USA. You may recall the 2006 movie called “Over the Hedge” that follows the adventures of a band of forest animals as they take their first excursion, well, over the hedge. Upon first encountering the towering hedge, the animals have no idea what it is and are afraid, so one of them helpfully suggests, “Let’s call it Steve!” to make the hedge less scary (youtube link — no really, watch it!). Fast-forward now to 2016, when citizen scientists in northern Canada spotted a strange purple ribbon glowing in the sky at lower latitudes than typical auroras. With no idea what it was and no scientific classification available, the scientists called the phenomenon “Steve” (originally as a joke in the spirit of “Over the Hedge, ” but the name stuck). Now, thanks to today’s authors, we’re closer to understanding STEVE. How is STEVE different from typical auroras? To understand why STEVE is so weird, we first need to know how auroras are produced. The details are complicated and not fully understood, but we know that auroras are primarily caused by the interaction of the solar wind with the Earth’s magnetic field. Charged particles in the solar wind cause strong electrical currents that excite molecules in the Earth’s upper atmosphere. Auroras are produced when the excited molecules emit energy in the form of photons and fall back to their ground states. Because this process intimately involves the Earth’s magnetic field, auroras trace magnetic field lines. The region where the field lines intersect with Earth’s upper atmosphere is called the “auroral oval” and is where auroras are predominantly observed (see Fig. 1). 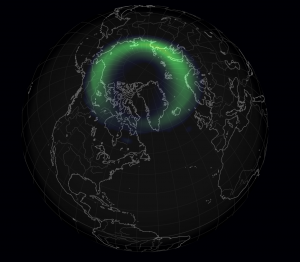 In times of increased solar activity (increased solar wind, solar jets, or coronal mass ejections, for example), the auroral oval can migrate south, treating residents at lower latitudes to spectacular nighttime shows! Let’s return to STEVE. Auroras take on different structures and appearances depending on the specific processes producing them. They can appear as a diffuse haze or a concentrated arc, or they can resemble curtains, rays, or even picket fences (see Fig. 2). The colors emitted depend on the altitude the aurora is occurring and on the atoms or molecules present there — red indicates high-altitude, green indicates the common mid-altitude aurora, and purple is seen in the lowest-altitude auroras. STEVE is an odd combination of all of these things: it is a skinny, bright, purple ribbon that appears for about an hour and is aligned in the east-west direction. Notably, it is produced south of the auroral oval. This is not unheard of, since auroras sparked primarily by the movement of protons tend to appear at more southerly latitudes. However, these “proton arcs” also tend to be very faint and diffuse, in stark contrast to STEVE’s bright and narrow structure. What the heck, then, is STEVE? So who…I mean, what…is STEVE? Time-lapse from an expert aurora chaser in Saskatchewan. Still photographs are shown in Fig. 2. The picket fence aurora is clearly observed, as is the motion of both the purple and green aurora in a westward direction. This indicates a turbulent local instability in the Earth’s ionosphere. All-sky imagers (ASIs) and meridian scanning photometers (MSPs) across Canada. The MSPs are sensitive to the particular wavelengths of light that accompany proton arcs. On this night they clearly showed proton arcs located 2 degrees poleward of STEVE, suggesting there isn’t a connection between the two. Additionally, in ASIs with narrow wavelength filters, STEVE is far fainter than typical auroras, suggesting its purple color is not produced in the same way as purples in typical auroras. Atmospheric electron and plasma measurements by the European Space Agency’s Swarm spacecraft constellation. Swarm A and C are in 450km-high polar orbits and pass through the northern and southern auroral zones every 96 minutes. They carry instruments to precisely measure the Earth’s magnetic field as well as electron and plasma velocities and densities. Taken together, points 1 and 2 suggest that STEVE is something totally different from typical auroras. The addition of the in situ measurements by Swarm finally allow us to probe the conditions under which STEVE occurs. Figure 3 shows Swarm A’s measurements as it traveled poleward across STEVE, which is indicated by the pink box. Panel A shows the intensity of STEVE measured by an ASI at Lucky Lake in Canada mapped to three different altitudes. The authors can’t uniquely determine the altitude of STEVE with only one ground measurement, but the measured intensity peaks inside the STEVE window regardless of the altitude assumed. 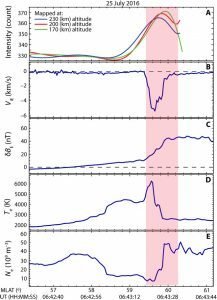 Panels B-E show significant changes in the ion flow velocity, deviation of the magnetic field from the undisturbed geomagnetic field, electron temperature, and electron number density measured by the spacecraft as it traveled poleward. The measurements in Panels B-E of Figure 3 are characteristic of a subauroral ion drift (SAID). SAIDs are short-lived events with supersonic westward flows of ions and plasma that are extremely long and narrow. They typically occur during auroral substorms, when Earth’s magnetic field suddenly reconfigures and sends showers of charged particles raining down. STEVE seems to check all of those boxes, and so has finally been given the backronym “Strong Thermal Emission Velocity Enhancement.” So it turns out STEVE really isn’t actually a typical aurora after all — it’s a SAID! However, the ion flow speed and the electron temperature measured by Swarm A are much higher than has been observed for previous SAID events, and SAID events haven’t usually been accompanied by optical emissions. We do know, though, that STEVE occurs at the boundary of the auroral zone and thus is an important probe of the complex interactions between Earth’s magnetosphere and its ionosphere. Future studies of STEVE will shed unprecedented light on the complicated processes occurring in the upper atmosphere of our own planet. While we still may not know exactly what STEVE is, today’s authors provided crucial insight by combining spacecraft measurements of STEVE with ground observations. There is good reason to believe STEVE is a type of SAID, but we don’t know why its ion flow speed and electron temperature are so high, nor how its optical light is produced. Today’s authors bring us a step closer to solving the mystery of STEVE, but there is still a lot more to learn! Finally, as noted by the authors, citizen science played (and continues to play) a crucial role in understanding STEVE. With the increasing prevalence of high-resolution smartphone and digital cameras, citizen scientists can easily contribute invaluable information about STEVE and aurora in general. Who knows, maybe you could name the next weird aurora phenomenon! A TED talk by the aurora scientist who coordinates the ASIs and MSPs across Canada, Dr. Eric Donovan. An interview with the lead author from today’s paper, Dr. Elizabeth MacDonald. 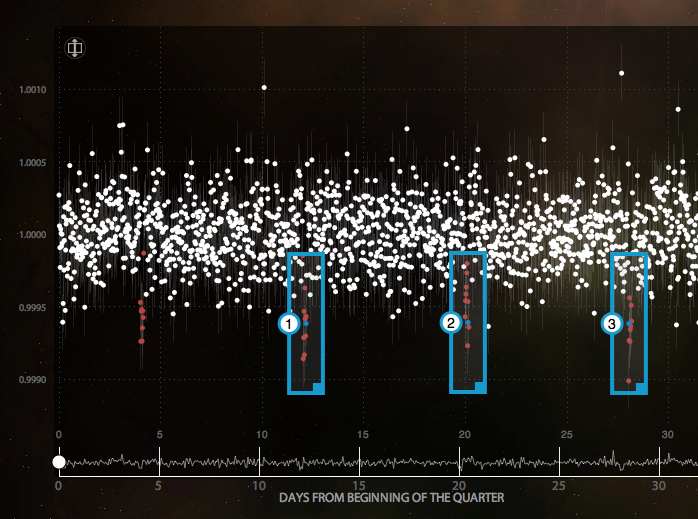 Crowd-sourcing Science: Planet Hunters find two new planet candidates Crowd-Sourcing Crater Identification Citizen scientists in search of failed stars Can we detect auroral emission from Proxima b?